3 Diamond Rating with AAA. 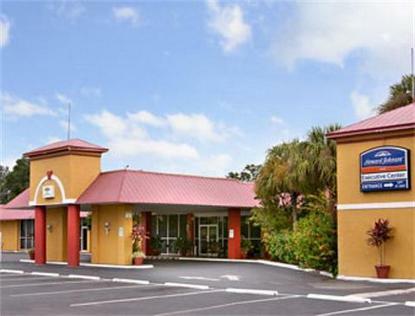 This Howard Johnson Inn - Executive Center in Lakeland, Fl is located right off of I-4 at exit 32. Extensive shopping and dining within 1/4 mile of InnHotel Amenities include - -Free HOT Country Breakfast Buffet daily, including meats, eggs, grits, biscuits and gravy, fruit and more.-Free wireless High-Speed Internet throughout the property-Fitness and Business Center on site-Meeting and banquet space available for up to 200. Group Menus available-Coconuts Lounge with live scheduled entertainment, including Comedy Club-Limited menu in Lounge Tuesday-Saturday-Outdoor pool with kiddie pool-Free ParkingIn-room amenities - -Coffee makers, hair dryers, iron and board in all rooms-Courtyard rooms have microwaves and refrigerators-Pay-per View movies available-Pets Accepted at one time Additional Charge of 25.00 - under 25 lbs.